I don’t like ends. You know, like the season finale of my favourite show, or realizing there is only one chip left in the bag. I’m always a bit antsy on Sunday nights and goodbyes are simply dreadful. But the big fat furry monster of them all is… the end of the year. New Year’s Eve. Damn that impending countdown. A tick tock, teeter-tottering atop the precipice of 365 days soaked in waves of deep conscious contemplation all the while waiting with baited breath as the curtain-raising cusp of all that was, was not, wants, want not, accomplished, or not coagulates into resolutions, convolutions, absolutions and the ultimate surprise behind door #2 that is about to drop on my doorstep in 5…4… 3… 2… Pass the champagne, stat! The Ode to One or as I like to call it “onezing,” shifts the gangbuster, go big or go home, all or nothing approach of chaotic accomplishment into simple, sensible, doable and feel goodable gestures. In short, it invites you to embrace doing just one good thing—for yourself, for others, and for the earth. Imagine just one desired shift a day or a week that will lay a path to get you where you want to be. By removing the pressure and expectation of instant change, this kinder, gentler pursuit makes transitions easier and a heck of a lot more enjoyable. For example—who really gets excited about the perennial new year battle to lose weight? With onezing, a desire to eat better starts with one daily shift – such as a new love affair with broccoli. Similarly, finding time to exercise is sometimes an exercise in itself. The singular notion of onezing, invites you to set a desire that is realistically possible to achieve. So commit to working out once a day—for 30 minutes. If you can do more—great, but if you can’t, you’re not setting yourself up for failure that often leads to throwing in the towel. Sometimes our desires feel so big they seem too hard to even begin. Think about training for a marathon, writing a book, starting a business or saving the world. The beauty of onezing is it actually gets you doing something—one shift at a time. Take the environment for instance. By choosing one eco-friendly effort—be it recycling or purchasing a sustainable product—you are onezing your way to the finish line! Another great thing about onezing is it builds momentum. These single shifts become manageable and even motivate more onezing to occur! Let’s say you want to become a nicer person. Start with giving out one compliment a day. I bet before you know it you’ll be dishing out dozens and probably getting some too. 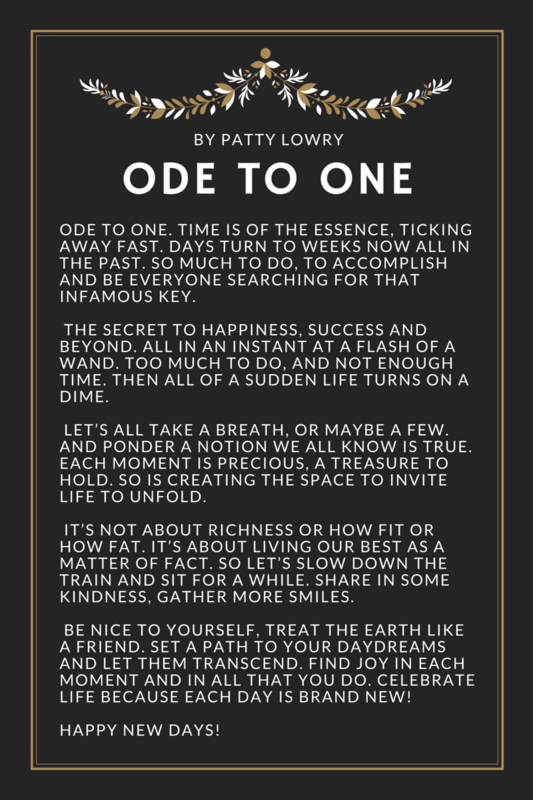 So to wrap up this little ditty and finish off the year with some thoughtful prose, I present you The Ode to One.